I just finished figuring out the Hideout's 2014 season, and I can't wait to tell you about it. It's hard to believe that it's only been since November of 2012 that we took over the coffee house and the downstairs theater. We're still very much growing into it. And that's going to be the theme for 2014: growth. I'll have more to say about that in a future announcement. For now I want to share with you the 2014 Mainstage season... full of shows that will take full advantage of the larger downstairs space. As you can see, there's a lot of variety, and a lot to love here. 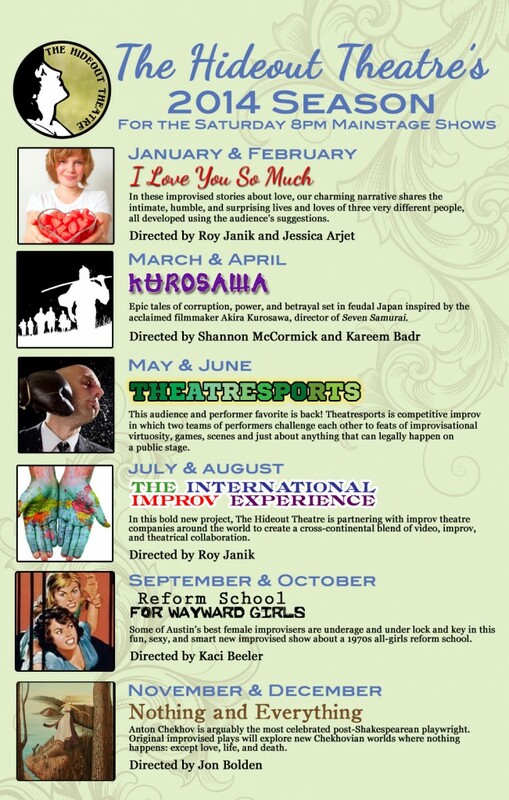 We're starting out the year with I Love You So Much, a show that weaves together improvised love stories. This is something we've toyed with in shows like Austin Secrets and Manhattan Stories. And Jules and Heather from The Maydays in England demonstrated the power of simple, compelling love stories at last year's Improvised Play Festival. So I'm really excited to get to dedicate a show to conveying love in all its many forms. And then to balance things out, we're going full on genre, with an improvised Kurosawa show. Samurais. Swords. Honor. Betrayal. What I'm really excited about, though, is that Shannon McCormick of Gnap! Theatre Projects will be co-directing the show with our own Kareem Badr. Ever since Gnap! shuttered its elaborate improv productions, I've been eager to get Shannon to do a project with us. He and Kareem are both geeks about Kurosawa, so I can't wait to see what they cook up together. I'm giddy about the July/August show, and a little apprehensive as well, as we've never attempted anything of this scale. Over the years of running the Hideout and going to festivals, we've made a lot of friends, both domestically and international. We're now on very good terms with improv theatre companies in Toronto, London, Montreal, Greece, Vancouver, Melbourne, and more. We're going to call on all of them to help with this show via video, recordings, photos, and other sources of inspiration. Just what that will look like is still to be figured out, but I'm excited about the possibilities. We're calling it the International Improv Experience. We rebooted Theatresports in 2013, and I was super happy with the result. Theatresports is an improv format created by Keith Johnstone, whose teachings form the basis of the Hideout's own improv style and philosophy. In the show, two teams go head to head, issuing improv challenges to one another. Not just games, but scenes, tests of intelligence... whatever. In the perfect Theatresports show, ANYTHING CAN HAPPEN. I feel like we got there a lot in the 2013 show, and I'm excited to build on that momentum in 2014. The Austin improv scene is super lucky to have a megaton of awesome lady performers, and we’re always looking for ways to showcase them. Kaci Beeler’s taking the helm to direct Reform School For Wayward Girls. This ridiculous show is set in the 1970s and features the bad girls therein. Secret smokes? Dangerous schemes? Drama? Rule Breaking? Punishment? Broken promises? Cat fights? Forbidden Romance? It’s possible… and probable. And finally to round out the year, Jon Bolden will be directing Nothing and Everything... improvised plays in the style of Anton Chekhov. Jon co-directed 2012's highly successful Manhattan Stories. If anything, he is even more passionate about Chekhov than Woody Allen, and that's saying a lot. This is a pet project of his, and he's super excited to finally bring it to life. I am, too. So that's the plan for the big 2014 Mainstage Season. But that's not even remotely all of the story. We've got some big things planned for 2014 in addition to this. I'll give you more details later, but they include limited engagement studio shows, student mainstages, and a brand new 'big' show that we've just begun to work on. Last edited by Roy Janik on October 8th, 2013, 8:09 pm, edited 2 times in total. Women's Prison is now Reform School for Wayward Girls, which (among other things) stands a better chance of not being mistaken for a parody of Orange is the New Black (not that there's anything wrong with that).